My decision to set up a professional company to train dogs and take comprehensive care of these unique creatures comes from two factors: my love for animals and my police training experience. Since my childhood I have had a lot of contact with animals and especially with dogs. Initially I was a farmer but later I decided that I wanted to be a professional dog trainer. 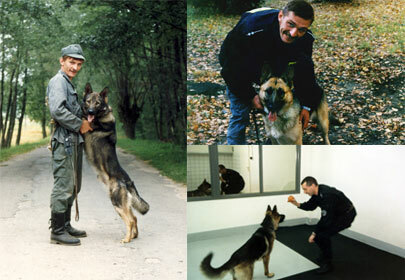 I started my career as a Police Dog Trainer in famous Police Training Department in Sulkowice in Poland. There I trained my first dog to reach Tracking-Patrolling Dog level. Then I completed a specialization “Human Track Identification”. 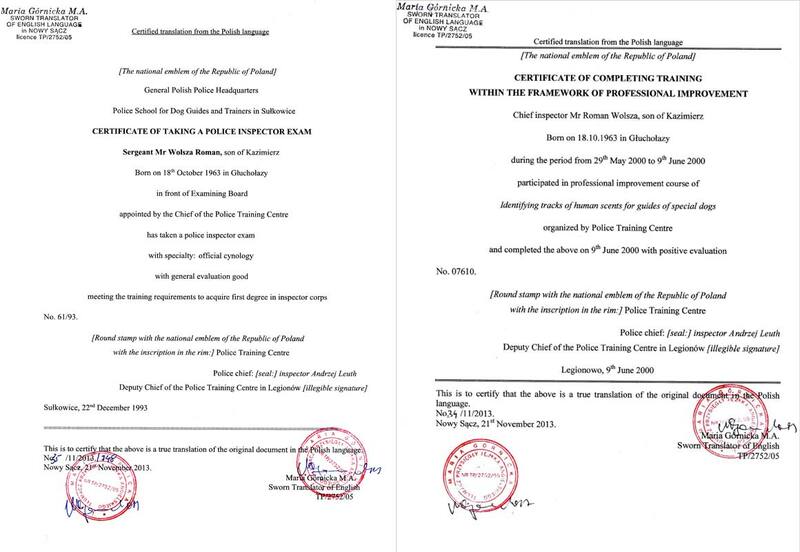 Belonging to the elite of police dog trainers, I worked with three dogs at the same time. I received many awards and distinctions for successes, training and dog performance. In short time I got my promotion to sergeant rank. The next step in my professional career was the Police Criminal Laboratory at the Regional Headquarters in Tarnow and then in Cracow. Dog which I trained and used was key element in the process of identifying human track place of criminal offense. Moreover in those days I trained dogs privately. My own dog and others who I trained participated at shows and competitions for Obedience and Working Trials. My dogs received many trophies and awards. 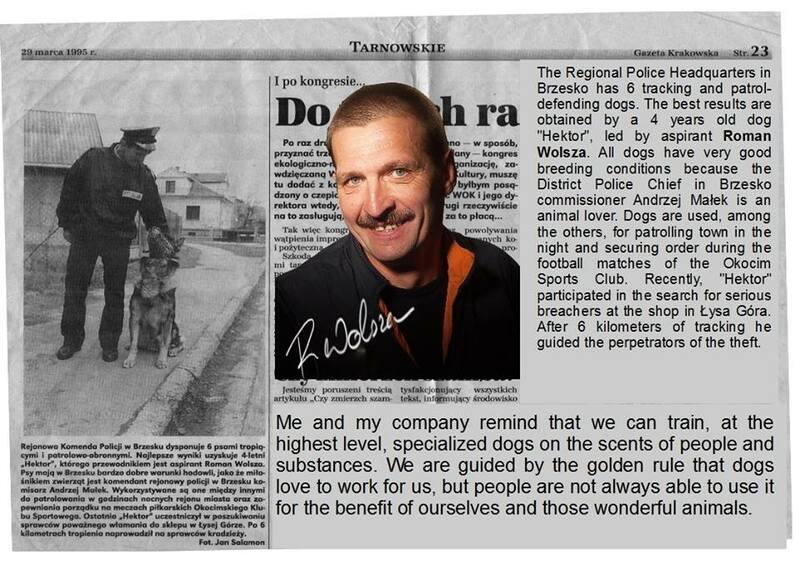 For many years I also cooperated with the Polish Kennel Club. My time in the USA gave me an opportunity to observe dogs and their living conditions from another perspective. I noticed that even small towns could be proud owners of playgrounds for dogs. This idea of fun interaction between dogs and people inspired me. Since 2005 I have lived with family in Ireland. Treating this as a hobby I have voluntarily trained dogs for friends and neighbors. The inspiration from USA about dog playgrounds come back. I still dream to have such a place in Ireland to meet with people, socialize and integrate across gender, age and race. It would be great place to have the opportunity to discuss about dogs. This long-term hobby and professional experience has given me a solid knowledge of dog training, anatomy and behaviour. 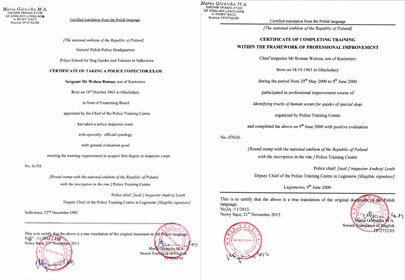 Ten years experience training gained as a police dog trainer and my passion cultivated in various forms allow me now to set up a dog-related business. I now wish to offer a comprehensive service in dog-care and training. Additionally I feel competent for assessments, evaluations, and advice for dog owners. My aim is also to cultivate an awareness of best practice, responsible attitudes and education of dog owners.